A super-bright space explosion has revealed a surprising look at the ingredients of two ancient galaxies pierced by the powerful beam of light emitted by the cosmic conflagration, scientists say. An international group of astronomers studied the brief but brilliant light of a distant gamma-ray burst, as it passed through its own host galaxy and another galaxy nearby. Using observations from the European Southern Observatory's (ESO's) Very Large Telescope at the Paranal Observatory in Chile, the researchers found that these two galaxies — which formed when the universe was relatively young — are richer in heavier chemical elements than the sun. The discovery suggests that the two galaxies are for more chemically mature than astronomers though was even possible for galaxies that formed during such a young stage of the universe's evolution. Gamma-ray bursts, which are the brightest and most powerful explosions in the universe, typically herald the destruction of a massive star. These explosions, while intense, are brief and usually do not last more than a few hours, scientists have said. Gamma-ray bursts are first spotted by orbiting space observatories that detect the initial short burst of gamma rays. Once the location of these bursts has been determined, ground-based telescopes are used to study the emitted afterglows in visible light and infrared wavelengths over the succeeding hours and days. One burst, officially called GRB 090323, was first detected by NASA's Fermi Gamma-ray Space Telescope. Shortly after, it was also spotted by X-ray instruments on NASA's Swift satellite and by the gamma-ray burst detector on the MPG/ESO 2.2-meter telescope at the La Silla Observatory in Chile. The burst was then studied in great detail using ESO's Very Large Telescope only one day after it exploded. 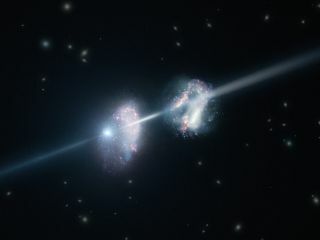 These observations showed that the light from the gamma-ray burst passed through two very distant galaxies — so distant that they are seen as they were about 12 billion years ago or 1.8 billion years after the Big Bang. Such galaxies in the early universe are very rarely caught in the glare of a gamma-ray burst, the researchers said. As light from the gamma-ray burst passed through the galaxies, gas in the galaxies acted as a filter and absorbed some of the light at certain wavelengths. Without the gamma-ray burst, these faint and far-away galaxies would be invisible, ESO officials said. As the light was absorbed, the astronomers carefully analyzed the telltale signs of different chemical elements and were able to decipher the composition of the cool gas in these distant galaxies. What the researchers found was that these two galaxies were surprisingly rich in heavy elements. Astronomers previously thought that galaxies in the early stages of the universe's evolution would contain smaller amounts of heavier elements compared to galaxies at the present day, such as our own Milky Way. Heavier elements are produced throughout the life span of generations of stars, whose births and deaths enrich the gas in the galaxies. Material produced by the Big Bang, which is the most commonly accepted theory for how the universe came into existence approximately 13.7 billion years ago, was almost entirely hydrogen and helium. Most heavier elements, such as oxygen, nitrogen and carbon, were produced later by reactions inside stars that are then injected back into the gas within galaxies as these stars die, the scientists explained. As a result, astronomers expect that heavier elements become more abundant in galaxies as the universe ages. According to the study's researchers, the newly discovered pair of young galaxies must be forming new stars at a tremendous rate, which could explain how the galaxies' cool gas was enriched with heavier chemicals so quickly. Since the two galaxies are located nearby one another, they may also be in the process of merging, which would trigger the formation of new stars as the clouds of gas collide, ESO officials said. Furthermore, the results of the new study support the idea that gamma-ray bursts may be associated with vigorous and widespread star formation. Such energetic star formation in these types of galaxies may have halted early on in the history of the universe. Twelve billion years later, at the present time, the remains of such galaxies would likely contain a large number of black holes, cool dwarf stars, and other stellar remains. These "dead galaxies" would be difficult to detect in present day because their emitted light would likely be much more faint compared to their more brilliant youths, the researchers said. "We were very lucky to observe GRB 090323 when it was still sufficiently bright, so that it was possible to obtain spectacularly detailed observations with the VLT," Savaglio said. "Gamma-ray bursts only stay bright for a very short time and getting good quality data is very hard." The researchers hope to observe these galaxies again with more sensitive instruments on future telescopes, such as the planned European Extremely Large Telescope (E-ELT), Savaglio said. The E-ELT, which is being built on the Cerro Armazones mountain in the central part of Chile's Atacama Desert, is being billed as the world's largest telescope.